Dry Body Brushing 101 – From Celebrities to Cellulite. Holiday season is fast approaching us and every year comes with the same concern … the bikini body!! Obviously as a model, it is part of my job to make sure my skin & body are in tip-top condition. Body brushing is one thing I can guarantee will transform you skin and general well-being. The ancient art of body brushing improves circulation, supports the lymph system, removes dead skin cells, eliminate toxins, AND can help reduce the appearance of cellulite. I can’t tell you how many celebrities swear by this simple ancient art to keep their skin looking it’s best, but to name a few … Elle McPherson, Miranda Kerr, Cameron Diaz, Gwyneth Paltrow (need any more persuasion?). If you haven’t tried body brushing yet, now is the perfect time. We spend billions every year on products and surgery to try and ‘fix’ our bodies. Body brushing is a simple and inexpensive means of looking after your skin with effective results and super health benefits!! You can dry body brush every day or once a week, just before you shower. It does take a while to form the habit, I often find myself remembering half way through my morning shower (oops!). Just fit it into your routine as often as you can, if I don’t have a lot of time I sometimes just focus on my area of concern (thighs). But I promise you will instantly feel the benefits of it and want to make sure you keep doing it. Not only does it feel great on your skin but you can also really start to feel the blood pumping as you go. The pressure on the skin and direction you brush in help to move lymph fluid around the body, boosting your natural elimination process and circulation at the same time. Not to be gross but the body eliminates 1/3 of it’s daily bodily waste through your skin, so give it the helping hand it needs. Always brush in an upwards direction towards you heart. It’s best to do in the morning before you shower as it will give you an extra boost of energy for the day! – Always brush towards your heart in long, circular strokes. – Start at your feet work to your thighs, then your hands and work to your shoulders. – Follow a clockwise direction on your tummy to help digestion. – Clean your brush once a week in warm, soapy water and air dry. 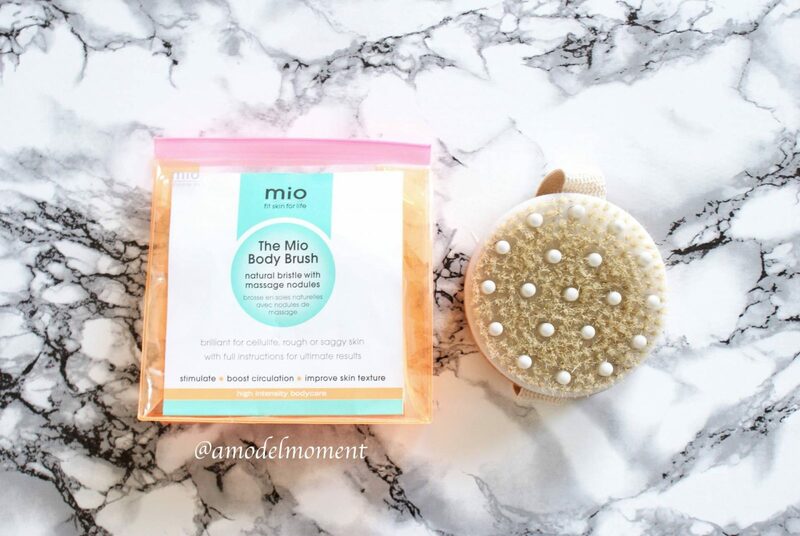 I personally use Mio Skincare’s Body Brush (£14.50) it comes with a very useful information leaflet on all things dry body brushing! It’s been my favourite one that I have used because it sits in the hand so easily and is made with natural boar bristles so will last a long time and rubber nodules to massage while you body brush. I promise you it’s worth the effort! Next Post Discover The Arches New Waverley, Edinburgh’s Most Exciting New Venue.